No noodles? 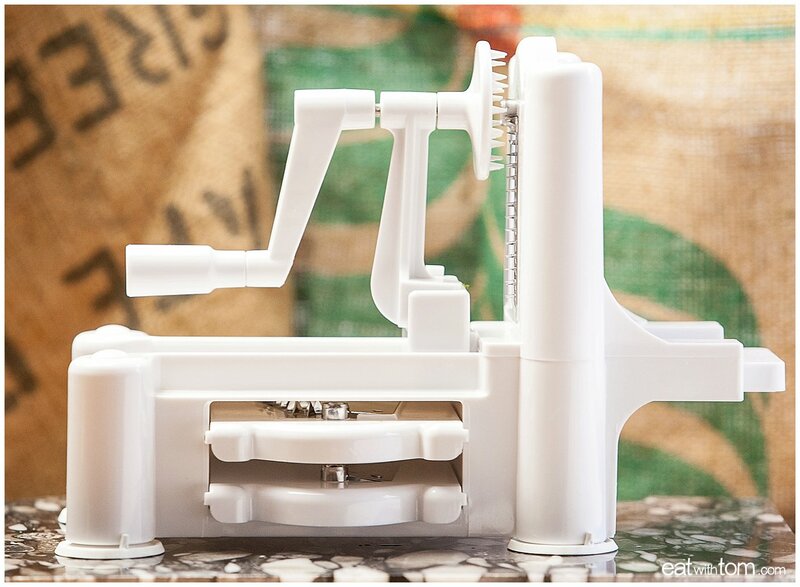 No problem… when you have a spiralizer! You are going to love the light freshness of the zucchini with the simple, slightly sweet home cooked tomato sauce for this dish. This fare satisfies and leaves you feeling full (which makes me happy) without the drag and resulting carb coma of demolishing a huge plate of pasta. It’s got a double whammy positive effect! I often make an entire meal out of a few heaping helpings of these zucs, but it can also make a nice side dish, or even an equal partner in a left-over buffet. I’m even happy to eat it cold the next day… Kind of like cold pizza? to the one I use. There seems to be about 5 different models on Amazon, but I think they are all the exact same. For 20ish bucks, you might as well try it out! to make it a bit quicker and cheaper for those of us city dwellers that have to buy our tomatoes. Even canned tomatoes combined with fresh onions, garlic and herbs will knock the socks off of any bottled up sauce. For the sauce flavoring I used an Herbs de Provence spice blend (savory, marjoram, rosemary, thyme, oregano and lavender) for two reasons, it’s a wonderfully versatile and fragrant spice for many dishes, and I have a ton of it right now… But feel free to get creative with your spice choice or just put in regular ole I-talian blend. 1. Add oil to medium saucepan and heat over medium-low heat. Dice onion by first cutting in half. Chop the top ½ inch off and score the outer skin to remove the dried layers. With the onion cut side down, cut parallel slits toward the root end, but stop with about ½ inch to spare at the bottom. This allows the root end to hold the slices together. 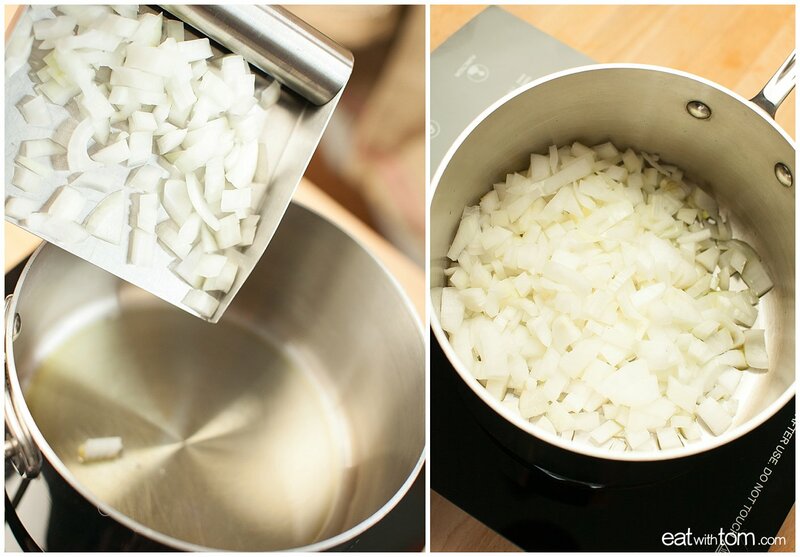 Turn the onion ¼ turn, hold the pieces together and cut to create the diced onion! 2. Add to heated oil and sauté for 5-7 minutes. 3. Crush garlic gently to loosen skin and remove. Trim the bottom of the cloves and use a garlic press to add garlic to saucepan. (Alternatively you can smash the cloves fully and mince them finely.) Add spice blend to saucepan. The hot oil helps to activate the dried spices. Saute for 2-3 more minutes. 4. Add entire contents of canned tomatoes (do not drain) to sauce pan. Simmer on medium-low heat for 30-60 minutes. 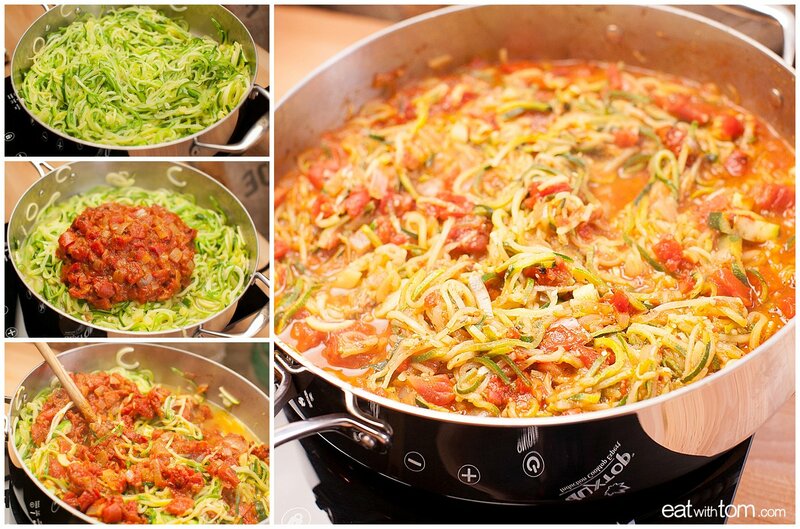 If you are in a rush, just simmer till your zucs are spiralized! 5. 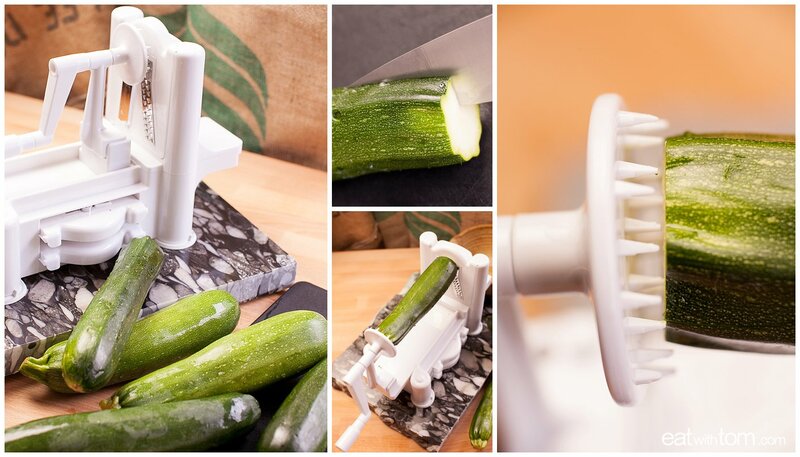 Prepare zucchini for spiralizing by trimming the top and bottom. Try to make your cuts parallel for easiest processing. Additionally, make a slit halfway through the zuc lengthwise to prevent the “noodles” from being 8 feet long. Unless of course you like sauce on your shirt :). 6. Insert first zuc into the spiralizer and begin spinning. I’ve found that putting downward pressure on the area above the cutting blade provides the best results. Be careful to stop spinning when ½ inch remains to avoid grinding up the teeth of the device. Repeat with all the zucchini. 7. There will be a few remnant pieces, but still perfectly edible! Chop these up and add to your noodles. 8. Add zuc noodles to a large (5 qt.) saute pan. Cook over medium heat for 10 minutes. Do not cover, because the zucchini will release some water and I have found it best to cook most of that off. 9. Once the zuc noodles start to become translucent, add tomato sauce and stir gently to combine. Cook over medium heat for an additional 5 minutes. Remove from heat and let rest for 5 minutes. No noodles? 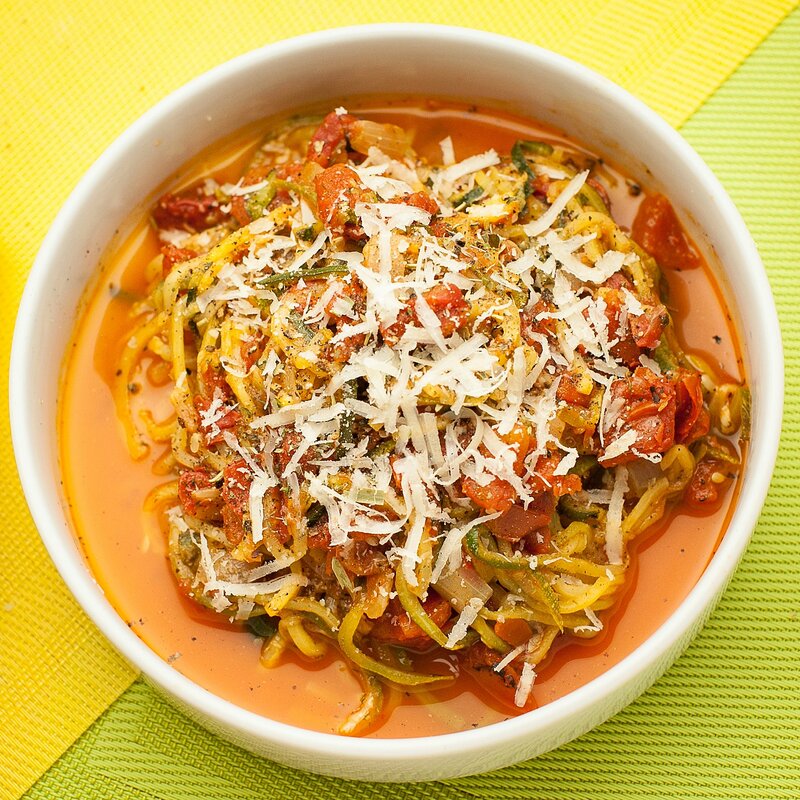 No problem… when you have a spiralizer! 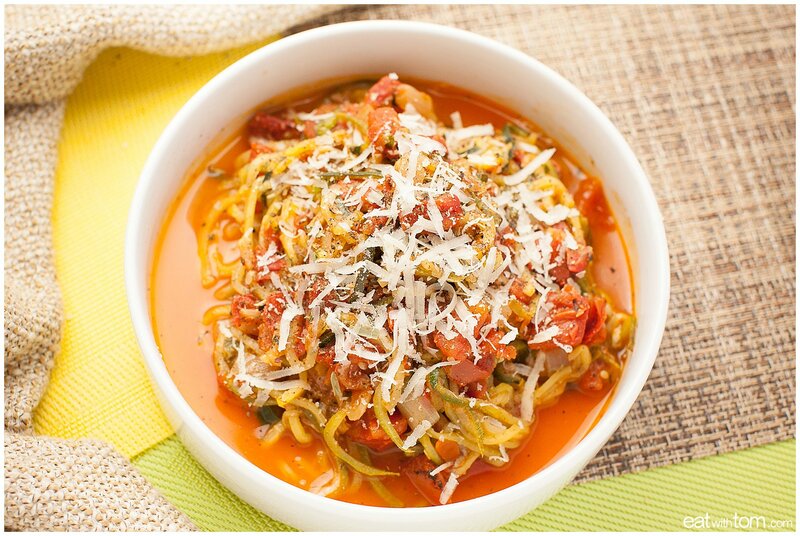 You are going to love the light freshness of the zucchini with the simple, slightly sweet home cooked tomato sauce for this dish. This fare satisfies and leaves you feeling full (which makes me happy) without the drag and resulting carb coma of demolishing a huge plate of pasta. Add oil to medium saucepan and heat over medium-low heat. Dice onion by first cutting in half. Chop the top ½ inch off and score the outer skin to remove the dried layers. With the onion cut side down, cut parallel slits toward the root end, but stop with about ½ inch to spare at the bottom. This allows the root end to hold the slices together. Turn the onion ¼ turn, hold the pieces together and cut to create the diced onion! Add to heated oil and sauté for 5-7 minutes. 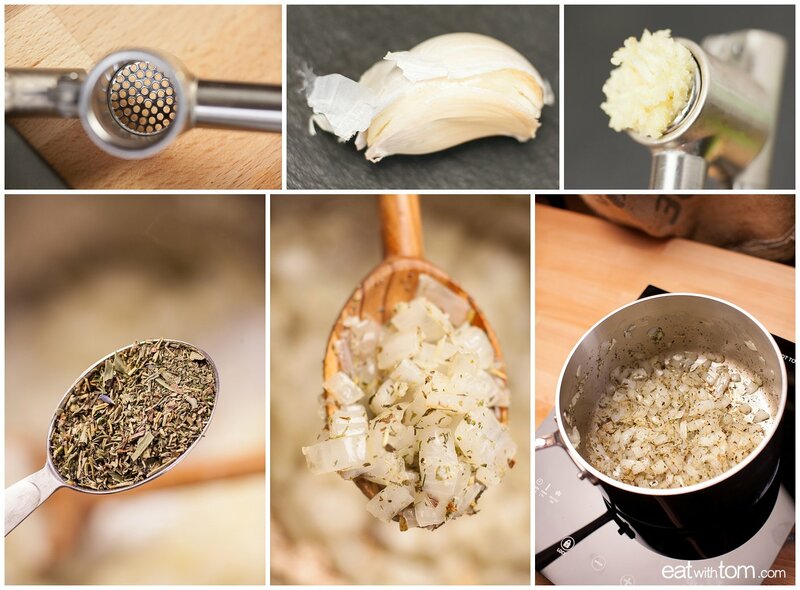 Crush garlic gently to loosen skin and remove. 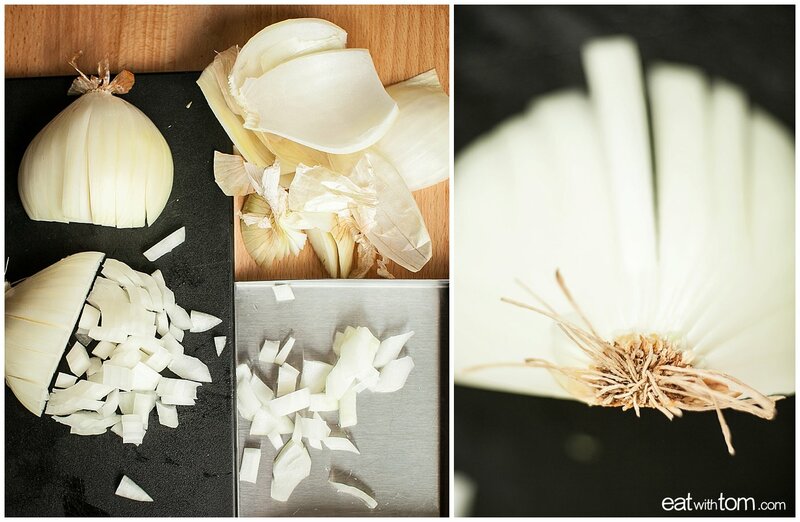 Trim the bottom of the cloves and use a garlic press to add garlic to saucepan. (Alternatively you can smash the cloves fully and mince them finely.) Add spice blend to saucepan. The hot oil helps to activate the dried spices. Saute for 2-3 more minutes. Add entire contents of canned tomatoes (do not drain) to sauce pan. Simmer on medium-low heat for 30-60 minutes. If you are in a rush, just simmer till your zucs are spiralized! 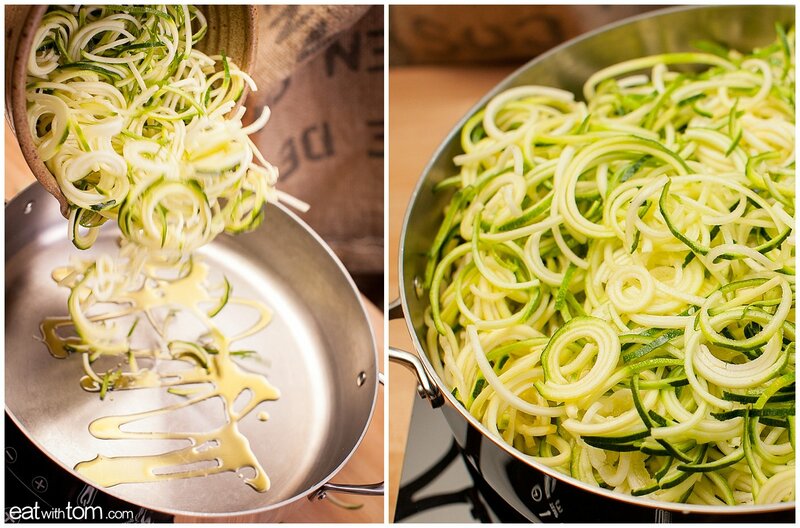 Prepare zucchini for spiralizing by trimming the top and bottom. Try to make your cuts parallel for easiest processing. Additionally, make a slit halfway through the zuc lengthwise to prevent the "noodles" from being 8 feet long. Unless of course you like sauce on your shirt :). 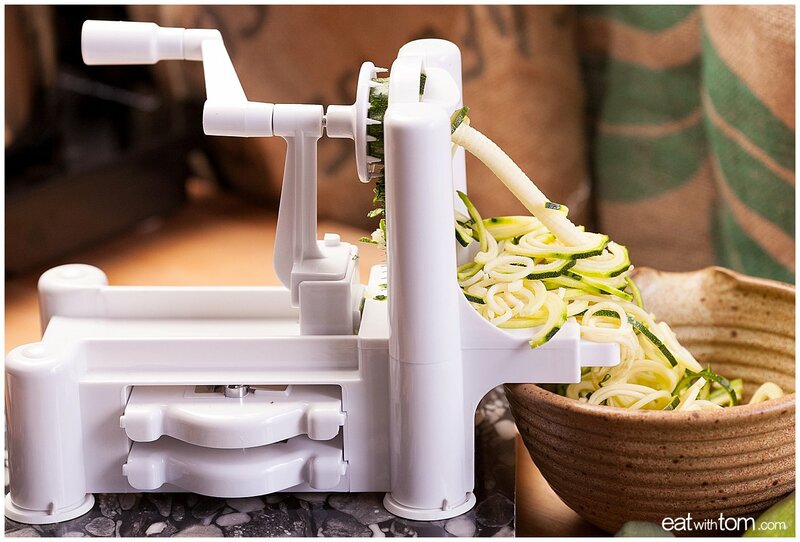 Insert first zuc into the spiralizer and begin spinning. I've found that putting downward pressure on the area above the cutting blade provides the best results. Be careful to stop spinning when ½ inch remains to avoid grinding up the teeth of the device. Repeat with all the zucchini. There will be a few remnant pieces, but still perfectly edible! Chop these up and add to your noodles. Add zuc noodles to a large (5 qt.) saute pan. Cook over medium heat for 10 minutes. Do not cover, because the zucchini will release some water and I have found it best to cook most of that off. Once the zuc noodles start to become translucent, add tomato sauce and stir gently to combine. Cook over medium heat for an additional 5 minutes. Remove from heat and let rest for 5 minutes. This recipe was so easy and very tasty. My boys went back for seconds and they are huge meat eaters! Highly recommended! 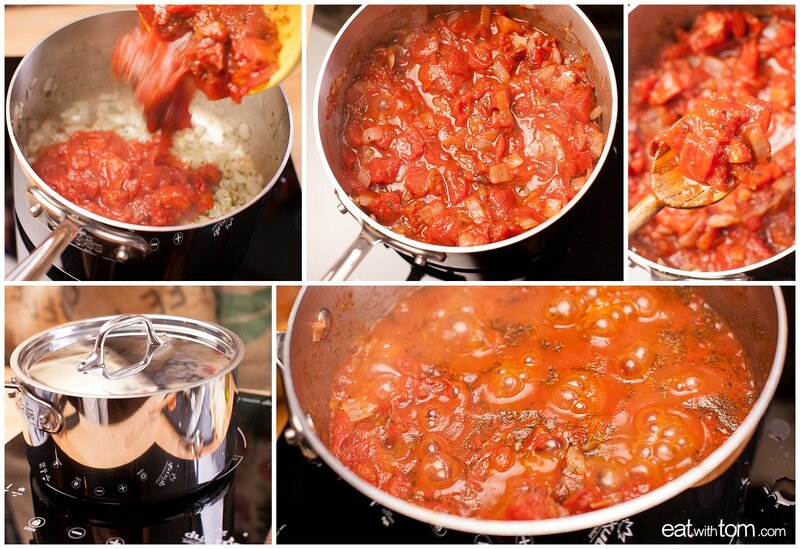 What size cans of stewed tomatoes did you use?